Many thanks to Mr. Jacob Ackerman, Director of Information Technology at Horizon Business Services for taking the time to write about his experiences with the eG Innovations software and services. We value every one of our customer relationships and it is accolades like these that motivate us to even greater heights. 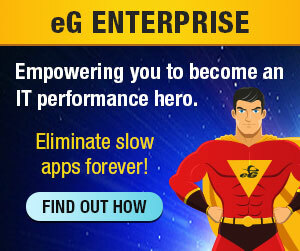 Anyone looking to monitor your Citrix farm needs to take a serious look at eG Innovations – https://www.eginnovations.com/. They have a great product and unbelievable support. Originally, I was looking at Citrix EdgeSight to monitor our XenApp 5 farm. While it’s a good product, it didn’t monitor the health of our entire farm/network. Problems caused by logon servers, database issues, firewalls, etc. just weren’t caught by the EdgeSight – it was just too focused on XenApp. We needed something that went beyond just XenApp. We’ve been using eG Manager for about a month and a half, monitoring Citrix XenApp, Citrix STA, Citrix Web Interface, Citrix License Server, Domain Controllers, Active Directory, SQL, Windows DNS, Dell iDRAC, standard WMI and Cisco ASA. Setup and implementation times were a fraction of what I thought it would be. The system comes with many preconfigured components each with their own preconfigured tests and thresholds. Within several days, we had metrics that made sense and allowed us to tune our farm. They also have some of the best support I’ve seen. The software is easy to use but with the scope of what can be monitored, questions come up. Their technicians have been fast to respond and have been spot on in their responses. Delivering return on investment in weeks, not years! And the best support possible, so customers value and enjoy the value of working with us.